But I'm glad I forced myself to stay focused. It's wonderful to have one room in the house entirely finished. To celebrate the completion, I created a Bedroom DIYs and Decor page that lists and links to all the DIY projects and decor in the room. As mentioned in previous posts, I recently hung two lamps in my bedroom, using plastic channels to cover the cords. I also added new wood trim around a window. I wanted to paint the channels and the wood to match the walls, and I needed to touch up some spots around the shelf I recently installed. So I purchased the same paint as on my walls... but the color was a little off. Not surprising with an intense purple, especially since the walls were painted six years ago. I decided to go ahead and paint the whole room. I used Behr "Wizard's Potion" in an eggshell sheen. It's very similar to the satin "Wild Elderberry" I previously used - just a bit lighter and with a softer sheen. The change is subtle, but it really freshened up the room. I am very happy with it. There are now just two items remaining for the bedroom: crown molding and valances. I have the molding on hand; I hope to get it painted and installed this weekend. 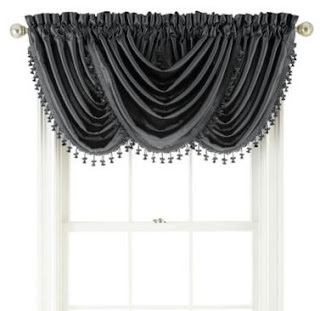 The valances are on order and should arrive Monday. I couldn't find exactly the style I wanted, but maybe these will work. I am now very close to finishing the bedroom. :) It will be so nice to have one room in the house completely done! I decided to add some trim around the window to cover all the holes and make the window look a bit more finished. I used pine 1x4s to create a sort of simplified Craftsman style casing and installed it with my pneumatic nailer. Because the trim will mostly be covered by curtains, I simply painted it the same color as the walls.